What follows is a guest post by Mark Thompson based on his interview with Bob Longmire, President of Longmire and Company. The topic of the interview centers on Longmire and Company’s national higher education co-sponsored study now in preparation for launch. When – more importantly why – did Longmire and Company start doing these nationally co-sponsored studies? Our first one was back in 2008. The economy was tanking and our clients wanted to know how it would impact their enrollment. So we conducted a study and asked students and parents if and how their plans might change relative to college selection. The information we obtained from that study was an enormously helpful to the co-sponsors and they began asking us to do more studies on important topics of the day. 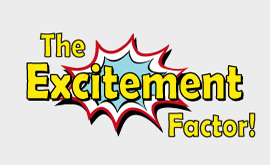 The study you’re getting ready to launch, “The Excitement Factor!” is the sixth co-sponsored study you’ve conducted in recent years. What prompted this topic? We made a fascinating discovery in our most recent study called “Your Value Proposition: How Students and Parents Form Their Value Perceptions and Select Colleges.” That discovery cried out for further investigation and insight. Of the three primary drivers of college selection, which are cost, perceived quality of the institution and the student’s excitement about attending, we found that excitement about attending is much more strongly correlated to likelihood of enrollment than the other two factors. And by “much more” I mean TWICE as much! The fact that excitement plays a role in college selection was not a revelation. What was surprising was how much stronger the correlation is to enrollment over other factors such as cost and perceived quality. Does this mean that excitement is the only factor influencing enrollment? Not at all! Students have to get information about cost and affordability. For some it’s a deal breaker right there. And they have to reach a degree of confidence that the institution’s programs, facilities and services have an acceptable level of quality. The thing is, though, the typical student will find many colleges that are affordable and of acceptable quality. This country is full of them. However, they are only going to get supremely excited about one of them in their mix of choices. And that college is going to win their enrollment. We actually explored all of this in a series of focus groups. What did you learn in the focus groups? This is where the discovery got even more interesting. Students were able to tell us the exact moment in time and place when they came to the realization that a specific college was going to be their new home. They could tell us exactly when and where it hit them. That’s when the deal was sealed for them. At that point all other colleges became an afterthought. Every student is different, obviously. For some it happens because of something a professor says to them. For another it happens when they are walking down a campus building hallway and see other students who are just like them. For others it starts when they are a sophomore in high school and their big brother takes them to a football game on campus. It can be in the cafeteria when a food-service worker behind the counter smiles and says something that makes them feel welcomed. It sounds like it sometimes has nothing to do with what college does and everything to do with the environment they are in and the people they are around. I wouldn’t say that categorically. Ideally, the college puts them in a position where the “aha moment” can happen. The challenge for any college is to find the best way to do that. I will say, though, that we learned in the focus groups that many things colleges do to try to generate student excitement is having the opposite effect. Students tell us that highly choreographed campus visits turn them off. They see them as a show or performance designed more for the hard sell and less to show them what life is really like on campus. Other turn-offs are excessive phone calls and emails that have no personalization. And any communication, for that matter, that is homogenized and impersonal, including many face-to-face interactions that they had with admission counselors, professors, and even current students on campus. What will be learned from the “Excitement Factor!” study? We’re going to explore a wide range of issues on when and how students reach their “aha moment.” What environment are they in? What are they experiencing? Who is with them? How the college has facilitated it or not. When it happens? If they haven’t reached an emotional epiphany, why not? We want to find out which recruiting methods and messages are most successful in putting students on a path where they land at a point of realization that they have found their perfect fit. How will this add to what’s known from all the research that’s already out there? It’s going to be very additive. There is no doubt that as an industry we capture a lot of data about students and how they select colleges and what influences them. But we don’t get into what’s happening to them emotionally. And that’s what drives the college selection decision. Facts tell. Emotions sell. Each co-sponsor in this study gets data back on the pool of students they surveyed for the project. How are the findings going to help them? The data produced from the study is crucial but there’s an added benefit to co-sponsoring the project. We meet individually with each co-sponsor when we present their data to them. It gives us all an opportunity to share opinions and recommendations based upon what we see. The discussion is very helpful to them. And it’s a lot of fun! Will non-sponsoring colleges benefit from the findings? Absolutely. An executive summary will be released nationally after all of the co-sponsors have been fully debriefed on all of their individual and comparative data. Naturally, the national report doesn’t include the depth of information available to co-sponsors and it doesn’t include the college-specific data that we collect but it still provides useful insights. We’ve done that with all of our studies and they are available on our website to download freely without any type of registration required. What types of institutions are involved in the study? Four-year not-for-profit public and private universities across the country. All shapes and sizes. How does an institution participate as a co-sponsor? Just call us. It’s really easy. The co-sponsoring college doesn’t have to do much other than provide us with data on the students they want to survey. We take it from there. We’ll be bringing colleges on board with this study through July and August and then begin analyzing and reporting data after that. Mark Thompson is a seasoned and successful higher education professional who has held positions in enrollment management at large and small, public and private institutions including The Ohio State University, Thiel College, Defiance College and other institutions. He follows and writes about developments in the field of higher education enrollment management.